For the first installment in this series featuring author Jeff Brackett, please click here. In this digital age, friendships are started and grow over great distances like never before. I have a lot of friends who are authors, but I’ve never met them – we live too far apart, and I don’t travel well. One of the few authors I’ve actually met in person is Gina, also known as G.M. Barlean. She and Victorine Lieske were at a writer’s workshop a few years back when we lived near Louisville, Kentucky, and we had the pleasure of spending a couple of hours with them. I hope you’ll enjoy reading her responses as much as I did, and I also hope you’ll pick up her books and give them a try. I think you’ll like them. Without further adieu… Is it Just Fiction, G.M. Barlean. Are the characters’ an extension of you, the author? If yes, in what way? I think so. Even though characters take on a life of their own, I imagine everything they do, so their thought process follows mine. Their lingo is something I’ve heard from somewhere. Their experiences are either similar to ones I’ve had or heard of. They often begin loosely based on people I know, or characters from TV or movies. Then, as I give them voice and thoughts, they really do begin to evolve on their own. The things they say and do come from an almost subconscious place in me. Well… that would make me worthy of institutionalization, don’t you think? Ha-ha. I know they’re just characters I invent, yet… while I’m writing it, I get a strong visual of them doing the things I write for them. I guess when I’m not writing about them, the movie is on pause. For the most part, they’re on the pages. There are bits and pieces of them in my mind, but I often have to reread chapters to familiarize myself with their events and ideas before I continue to write. Who knows. I suppose they’re running around naked and living it up. Just kidding. They’re just lolling around in my brain waiting for me to pay them attention. Kind of like a cat sitting outside the bathroom door while its owner busy. They seem to just wait. Maybe meow once in a while. So yeah… maybe my characters say “Hey,” once in a while. Well, first of all, great word – diametrically. My antagonists or villains are pretty much heavy on faults and I don’t agree with them. It helps me dislike them while I’m writing them, and so I can really get into making them do the terrible things they do. I have very little empathy for them, and that actually causes more of a problem because I need to make sure they’re human and have some redeeming qualities, too. I say, let the outline be damned. The character trumps outlines all day, every day. I trust them (and my subconscious from where they come) and you know, if it turns out they’re wrong and the direction they take me stinks, then I just erase the whole thing and guide them in a different direction. I’m afraid it’s far more character driven and I’m not sure that’s a good thing, but it’s my thing, nonetheless. Since she has a new release, I asked G.M. who her favorite character was from that book. Here’s what she said. My favorite character in the Bad Blood book is Doug. He’s just a big, unassuming guy who had a tough childhood. He could have become an angry man and was when he was younger, but now in his sixties, he’s just glad for the simple things in life. He says the things we all think but don’t say out loud. He’s an old hippy-type dude. Loyal as a good dog. He has no agenda whatsoever. Out of the entire series, I love the characters of Debbie and Doug Jr. the most. Gina M. Barlean is a Nebraska author who writes mystery and suspense with a Midwestern voice, and characters who could be anyone the reader might know—a co-worker, an aunt, a neighbor, or even themselves. She has written nine books. One book is a collection of non-fiction essays, one is a self-help book about networking, and the other six are suspense fiction ranging from cozy mystery to dark, almost horror, to main-stream fiction with historical elements. 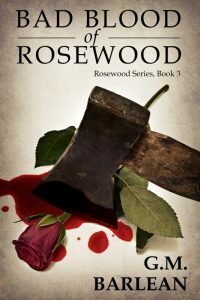 Her ninth book (Bad Blood, available now) will complete the cozy mystery trilogy of the Rosewood series. Small rural towns and Midwestern perspectives are something she knows well. It takes a curious mind and good imagination to stay entertained in a one-stop-light town. However, don’t be fooled. Interesting things can happen anywhere, especially in G.M. Barlean’s books. Be assured, all is good in the simple lives of her and her family… but in her books? Not so much. Conflict is alive and well in the novels she writes. G.M. Barlean has been a professional photographer, managed her small town’s Opera House, and worked with entrepreneurs as the director of her town’s Chamber of Commerce. She’s gone to culinary school, where she discovered opening a restaurant was not her life dream after all. Her husband tolerates all of her changing moods and adventures like the good soul he is. You can find G.M. at her website, on Facebook, Twitter, or at Amazon. Her latest release, Bad Blood, is available here. Thank you so much for spotlighting me here on your website! Great questions, by the way! !